There are certain things in life that are taken so much for granted that most people don't even think about them from day to day. Whether it's being able to reach up into a high cupboard, walk unaided to the bathroom or holding a hot cup of coffee with just one hand, there are countless small obstacles most people don't have to think about being able to do. For people with disabilities, however, these mundane tasks require more effort. Jenny Schmoock lives and works in the northeast Wisconsin town of Shiocton, not far from Sunset Hill Stoneware's facilities in Neenah. She was born with a congenital defect called ectrodactyly. There are several types of ectrodactyly, all of which have very different symptoms. Due to its affects on multiple chromosomes in the DNA, Type 1 affects development in the sweat glands, teeth and auditory system, along with hair loss. A rarer condition, ectrodactyly Type 3 causes delayed or misaligned development of the hands and feet. Some people with ectrodactyly have malformed hands or feet, while others may have missing fingers or toes as well. In Jenny's case, she was born with several fingers missing and at least two fused together into one digit. This particular version of the condition is caused by abnormalities in the No. 10 chromosome in a person's DNA. Jenny only found out about the link between ectrodactyly and a recessive gene she carried when her daughter was also born with the birth defect. Before undergoing genetic testing, Jenny and her parents had thought the condition stemmed from medication her mother had taken while she was pregnant with Jenny. Throughout the course of her life, Jenny has adapted to living with her condition and taught her daughter to do so as well. When drinking tea or her morning cup of coffee, she has had to spend much of her life using both hands to be able to pick up the mug. This may not seem like much, but it can easily grow into an inconvenience—for example, drinking coffee and talking on the phone at the same time is a challenge. In fact, just about any multitasking while sipping her drink can become difficult. "I'm a little too big and a little too old to be two-handing," Jenny said. "Grabbing onto things is probably 90 percent of the day. Everything you do, you grab onto it, and I have to find a different way to do that." Jenny has had to adapt other everyday tasks and objects for her condition as well, including a custom throttle for her ATV and other customized products. Due to her left hand being stronger than her right, she is a lefty. 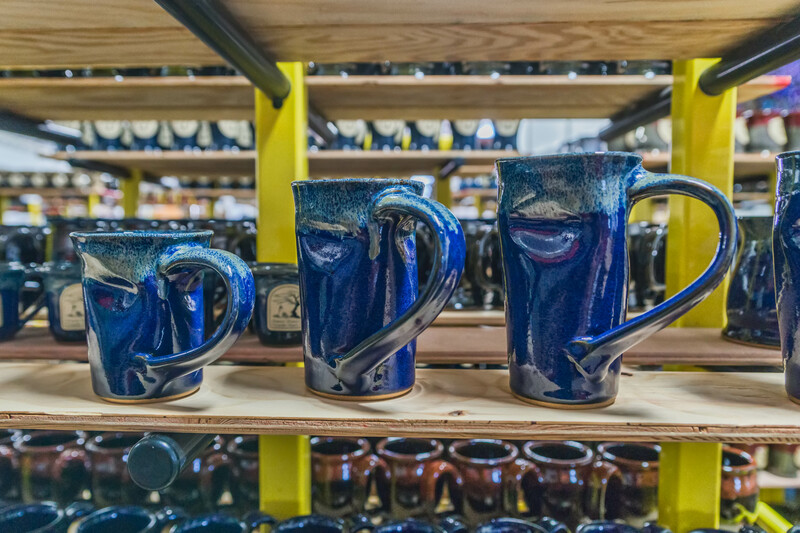 After hearing about Jenny's difficulties through a few mutual connections, the team at Sunset Hill Stoneware was happy to help her create mugs she could use with only one hand. In fact, ever a fan of functionality, our head potter and production manager Jason Sonsthagen was eager to help her out and undertake the challenge. The process started with a Mountain Dew can. In order to drink with one hand, Jenny would have to crush the sides of an aluminum can into a certain shape so that she could use it one-handed. With the smashed soda can as a reference, Jason recreated the dents in the sides of a few mugs for Jenny. It was an effort of trial and error. The first few prototypes Jason had thrown on his trusty pottery wheel weren't easy for Jenny to grip, largely because her hand didn't fit comfortably inside the handle. More design tweaks followed. 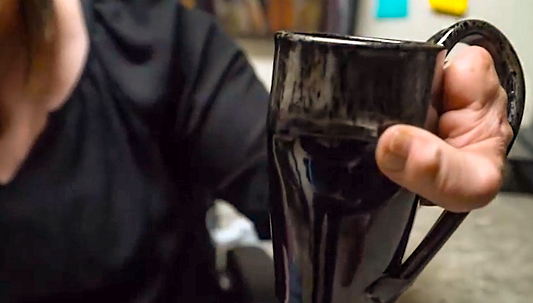 Finally, after a few more weeks of experimentation and decorating her mugs with our glazes, Jason brought Jenny a set of mugs that perfectly fit her hands. The handles on the second batch were designed so Jenny could fit her wrist inside them. While the handle is primarily meant to give her hand something to rest against while she grips the mug, it also acts as a safety net in the event the mug slips out of her hand. It will hang onto her wrist instead of spilling. Even more, her customized mugs are designed to fit into any standard cup holder. 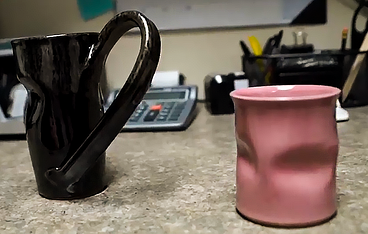 While Jenny was able to live her life before, the simple addition of a custom coffee mug built for her has changed everything for the better. With a mug that fits perfectly to her dominant hand, she has been able to not only multitask while drinking her coffee, but even just have her first cup in the morning with one hand if she so chooses. "It's not so much that I didn't make it work, but this has made life a whole lot easier," Jenny said. When Jenny tried out her mug with a hot cup of coffee for the first time, she became a little emotional. Never in her life before that moment had she been able to use a coffee mug with one hand, and now she had a whole set made just for her. "I was actually really surprised," Jenny said. "I didn't think it was going to be that perfect. I guess I thought it was going to be more difficult to make it custom, and they were happy to do it and he made it seem really easy. "It's a one-of-a-kind," she added. "Everyone around is afraid to wash it for me. They're afraid to break it!" Additionally, when she wants to take her coffee to go, Jason has supplied Jenny with silicone lids to put over her mugs. This way, she can bring her coffee with her in the car on a long drive or as she's commuting to work in the morning. At this time, we haven't offered this to anyone else; only to Jenny as it helps her be able to live life with greater accessibility. Also a carrier for ectrodactyly, Jenny's daughter, Grace, has similar issues with being able to hold things in her hands. Since she's still so young, however, she does not have the dexterity and hand strength her mother has yet. Again, Jason stepped up to the plate to make life a little more accessible. Because Grace's hands are shaped slightly differently from Jenny's, Jason also made a customized cup with no handle for her—her very first big-girl cup. While Grace does not yet have the strength in her hand to pick the cup up with only her dominant hand while it's full, she's still able to lift it while it's empty. Pretty in our Passion Pink, the customized cup is designed to fit her smaller hands. There is no other cup like it in the world. Ectrodactyly is a rare but very visible condition. Some members of the wider public tend not to understand the nature of the condition, which has made life harder for both Jenny and Grace. 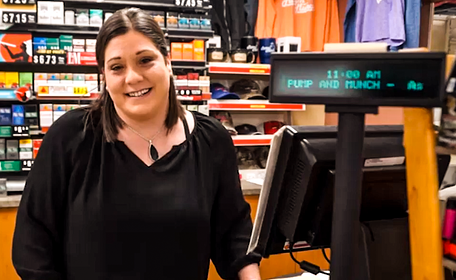 While Grace has faced uncomfortable questions from a few of her classmates, Jenny has dealt with outright rudeness from customers at work. In one instance, a customer refused to let her handle his money or purchases and told her so directly. "That was difficult to hear, that somebody felt that either it was disgusting to touch or if he thought it was contagious, but he very rudely did not want me to touch him, hand him his money, anything," Jenny said. "I wouldn't be in this profession if I couldn't give it to you. If it was contagious, I would not have the job I have." Because their condition is so visible, Jenny has made it a point for her and Grace to teach others about it whenever it comes up throughout the day. It's a lesson in accepting differences and promoting a positive experience that everyone should learn. "Everybody's born differently," Jenny said. "Some of us have red hair, some of us have blond hair, there are different things about all of us. Ours just happens to be our fingers. That sets us apart." Jenny encourages Grace to educate people, as not understanding or being afraid is the reason why most people stare or act rudely. It may be a hard lesson for some people to learn, but it's an important step in helping others understand the nature of her condition and other mobility-limiting conditions. "It isn't always in a negative way that people are watching, so I try to teach her that she has to think about that first," Jenny explained. "Instead of taking it personally, she needs to have that confidence that there is nothing wrong with her, there isn't anything she can't do. She just might have to explain to a few people and educate them that it isn't contagious and doesn't hurt." Ultimately, Jenny's decision to accept herself was a decision she made not only for her well-being, but for Grace's too. "I cannot prove to her that she's perfect if I think there's something wrong with myself," she said. "I don't hide; there's no reason to anymore."